I almost thought this block was TOO easy to choose as a lotto block choice, but … I think these technique blocks are fun and we all should have a few in our quilting repetoire in case we ever need to make a quilt really fast. I’ve seen it called a couple things, but we’ll call it Disappearing 4-Patch (or D4P) and make 8-1/2inch blocks (finished size is 8 inches when the blocks are sewn together into a top) in red and white. We’ll use the measurements she provides: begin with 5 inch squares and make your cuts 1 inch away from the 4-patch seams. RED Fabric – may be solid, hand-dyed, batik or RED prints which are tone-on-tone (Red-on-red) or contain small amounts of black or white. They should “read” as red. 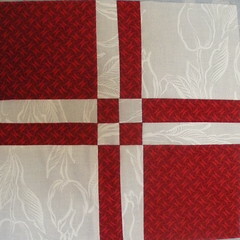 If you make multiple blocks, you must use a unique red fabric for each one. WHITE Fabric – may be solid or WOW (white-on-white). You may use the same white fabric in all your blocks. Here are 89 of the 97 blocks already made by sneak peekers, Blondie, Brenda, Caroline, Cathy, Cheri, Ginny, Julie P, Julie Wy, June, Kasey, Kate, Kathie, Kim, Laurina, Maree, Mary Jane, Rho, Shelley, Wendy, Wilma and me. You can see the incredible selection of red fabrics–I think I only saw one repeat–in the flickr photo set Disappearing 4-patch. If you are one of the quilters who made one/some of these blocks, please be sure to check the block list in the left side to make sure I have your blocks listed correctly … thanks! My 3 blocks don't appear in the sidebar ! The virtual quilt looks great! I fixed it. Sorry for the oversight.